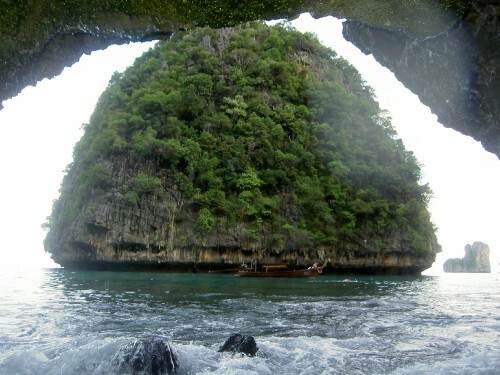 We arrived by boat from Railey beach at Ko Phi Phi, which is famous as it was where the film the beach was shot. The island was also badly damaged by the Tsunami that hit the region on boxing day 2004. As well as the damage to the island a lot of lives were also lost here. As soon as we got off of the boat we decided to go for some breakfast along the main central street, I had dippy boiled eggs and soldiers and Wayne opted for a BLT sandwich. We then walked on trying to try and find some accommodation. Ko Phi Phi is also popular with divers as it is one of the best dives spots in the world, on passing one of he dive spots an English guy came out and gave us a map and told us the best area to look for somewhere to stay, it was a really nice gesture. We decided to head back to the ferry dock and get one of the agencies to find us somewhere as all the places we had stopped were quite expensive. They found us a 400 baht per night room, which was in the area we had been told to go. As there is no traffic on Ko Phi Phi the guy that took us there put our bags in a trailer and pushed then all the way there, very handy for us. The room was on the hillside Tsunami evacuation route, looking out over one of the twin bays, it was basic but clean. The small area between the twin bays of Ko Phi Phi is the main town and has plenty of bars, restaurants and shops. The area was totally washed away when the Tsunami hit and all of the accommodation had been rebuilt and many of the businesses are back up and running although there are still areas by the beach that have not been replaced maybe due to scare factor that another wave may hit. Our first afternoon saw lots of rain, which is typical of this time of year as the monsoon season is just coming to an end. The following day was bright so we walked down to the beach, the water was very clear and there were lots of people around as it is very popular. We were quite surprised that the beach had lots of rubbish, like wood and branches as well as everyday rubbish. I think this area has not fully recovered from the Tsunami and just behind the beach is an area of wasteland that had not yet been redeveloped. We relaxed for a couple of hours within this time the tide had gone miles out so we decided to walk to Ao Ton Sai bay, the 2nd of the twin bays, this is less of a swimming beach as this is where the boats arrive due to the deeper water in the bay. We walked along the small beach area which was lovely and deserted apart from the fishing boats and a couple of scuba divers learning to dive. The rain then started again so we relaxed back at the room, where we managed to negotiate a cheaper nightly rate. As we are further South now the area is predominantly Muslim with many restaurants not serving alcohol or Pork. We decided to have Italian and we both ordered Pasta, a nice fresh salad and garlic bread it was a lovely meal. Afterwards we walked along the seafront to the Apache bar which was really busy the entertainment was a fire show, about 3 or 4 fire throwers performing together they were very good. Our final stop of the evening was the Irish Bar which had just reopened for the season and was having a wet tshirt competition, all very touristy. The following day it rained so we did nothing but read and relax and it was nice, we also managed to negotiate an even lower nightly rate for our room, so an added bonus. Wayne met a German guy called Martin who was staying at our guesthouse they sat outside and had a few drinks he then came for dinner with us. We then went to a bar where they were showing Thai boxing. This boxing however included a volunteer customer and a Muay Thai boxer. The first few rounds were funny, with the customer dancing around and dodging out of the way. In the 3rd round the Thai boxer got a bit more serious and both were landing punches it was all very amusing. Then it all got a bit serious the Thai boxer landed a punch and knocked matey over, he was covered in blood and very dazed, he was struggling to stand!! It all went very quiet in the bar and everyone was stunned that it went that far and he got so hurt, even though the guy had agreed to get in the ring! He was pretty angry himself and was shouting that his tooth had been knocked out! That was enough entertainment for us and we left. The following day was much brighter and after breakfast we decided to go to another beach on the island. Had Yao beach also known as long beach which was a 1/2 an hour walk along the main street and then over a couple of hills. When we got there we were glad we made the effort as the area was lovely, a few bungalows with some a resort at the far end of the beach. The bay had beautiful white sand and turquoise water. We spent the day in the sun reading, swimming and snorkelling. The water was a little cloudy probably due to the rain, but we still managed to see a lot of fish around the shallow rocks and coral. We had a nice lunch at one of the beachside restaurants, before the sky clouded over in the late afternoon. We decided to walk back over the rocks as the tide had gone out, although it started to spit with rain again as we crossed a couple of the small secluded bays. I think that Long Beach is one of the best beaches we have been to, it is a shame we could only make it there on our last day. In the evening we had a disappointing meal in the rock bar, we both ordered different meals but ended up with what looked and tasted the same, we made our way to the sports bar, to watch the England V Russia euro qualifier. The game was awful as we got beat and played terribly. The bar was nice and reminded us of home as on the bar they had some bar mats from "Archers Brewery Swindon" what a small world.